Ms. Catherine Klod has been appointed to the position of Principal at Queen of Peace High School effective January 4, 2017. Ms. Klod has been a faculty member at Peace for 10 years, and most recently has served as the head of the English department for the past four years. Over the past decade, Ms. Klod has been an integral part of the Peace community and has been engaged in student growth on both a spiritual and academic level. Ms. Klod has been the coordinator of the VERITAS retreats, senior class moderator, Director of the Peace Dance Company and coach of the Competitive Dance team all while teaching Honors and Advanced Placement English. Ms. Klod is passionate about Queen of Peace and student success. “Ms. Klod is the essence of Queen of Peace. She is a competent, confident and courageous woman who cares deeply about the students, faculty and staff at Peace. She is a strategic thinker who brings a tremendous amount of enthusiasm to her new role,” said Anne O’Malley, president of Queen of Peace. Ms. Klod comes to Queen of Peace after spending seven years at Nazareth Academy. She holds a bachelor’s degree in English from Loras College and a master’s degree in Curriculum and Instruction from Loyola University. 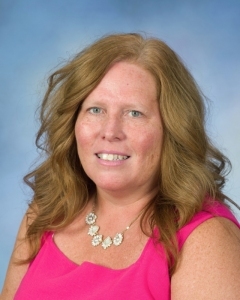 Ms. Klod will be supported by Ms. Laura Storino, a 1996 Queen of Peace alumna who has been a faculty member at Queen of Peace for 9 years and is currently in her second year as the Dean of Academics.